Highlights from the first article in top-tier higher education journal to ever mention autism. A new model to help students and institutions anticipate, address, and overcome challenges that might otherwise undermine the chances of success for college students with autism. Links to additional resources including handouts, slides, literature reviews, news stories, and more! By the year 2020, as many as 433,000 students with Autism will be enrolled in college. The number of college students with Autism is growing at a rate faster than nearly any other demographic. Many individuals with Autism achieve academically at the same or higher levels than their typical peers, and would likely succeed at the college level with appropriate support. Students on the Autism spectrum may be particularly well-suited for success in STEM fields due to their ability to observe, identify, construct, and apply logical systems of reasoning. But statistics highlight current difficulties. Between now and 2025, there will likely be 800,000 to 1.1 million high school completers with Autism who will NOT earn a college credential. There are likely millions of adults (age 25+) with Autism who never went to college. Disability service centers may be the natural starting place when considering how an institution facilitates the success of its students with Autism. 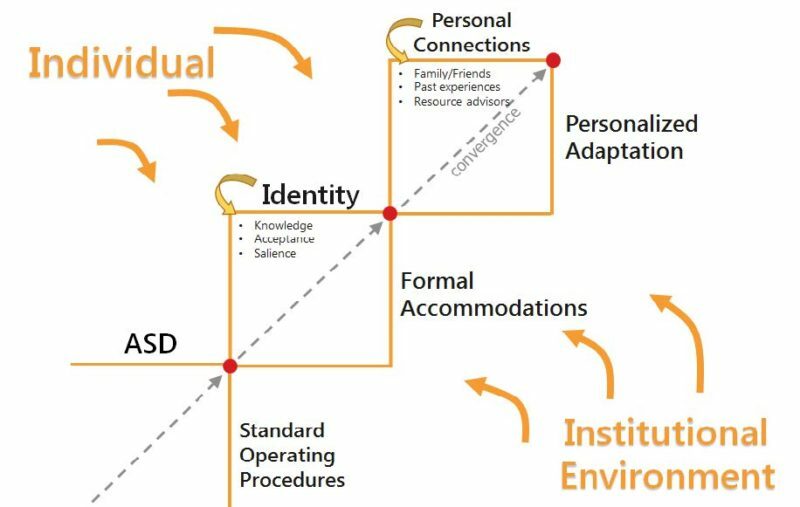 Moreover, having a specific advisor (or “case worker” of sorts) for students with Autism could serve as a consistent point of contact for neurodiverse students and would be an enormous benefit in helping them navigate institutional processes and structures. Even without the resources to implement specialized positions, institutions can still make subtle changes to support students with Autism. guidelines for resolving roommate conflicts) would not only facilitate success for students with Autism, but would also benefit countless other students who do not have (or do not disclose) any disabilities.